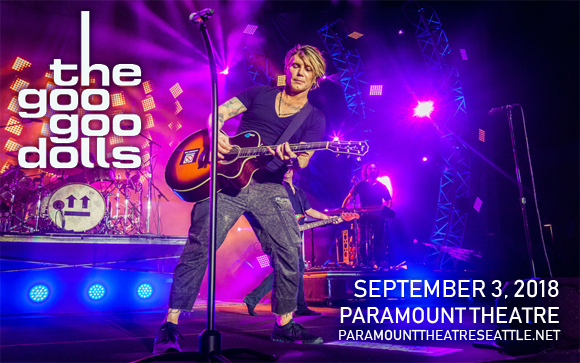 Revisiting their 1998 triple-platinum smash hit album Dizzy Up the Girl, Goo Goo Dolls are headed to Paramount Theatre Seattle on Saturday 3rd November 2018! Celebrating the album that launched hits like "Iris", "Slide", "Black Balloon", "Dizzy", and "Broadway", the band will be playing the record in its entirety for this very special show! "It's as new as the first day I played it," Said lead singer Johnny Rzeznik of the band's hit song "Iris". "I just find myself always grateful that song came into my life … It's one of those things like getting hit by lightning: It doesn't happen very often." American rock band the Goo Goo Dolls formed in 1986 in Buffalo, New York, releasing their self-titled debut album on independent label Mercenary Records the following year. The band's fifth studio album, A Boy Named Goo (1995), presented a more radio-oriented rock sound than their previous punk rock efforts, and served to be the band's mainstream breakthrough, launching the hit single “Name”. The band continued to have a string of successful hit singles throughout the mid-1990s to mid-2000s, including their best-selling single “Iris”, which was featured on the soundtrack to the blockbuster film City of Angels. “Iris” spent nearly twelve straight months on the Billboard charts and held the number one position on the Hot 100 Airplay chart for eighteen weeks, as well as topping Billboard's "Top 100 Pop Songs 1992–2012" chart in October 2012, which also featured their singles "Slide", ranking at number nine, and "Name" at number twenty four. The band will tour throughout 2018 to mark the twentieth anniversary of their triple-platinum-selling sixth studio album Dizzy Up the Girl.